Race to Adventure! expands with this double-mini-expansion pack! In the Dinocalypse Now mini-expansion, you'll dodge psychic dinosaurs as they burst through their time-portal ... and travel to the Century Club's most secret base on the island of Kauai. Can you protect your clues and win the Race all while on the run from a reptilian menace? 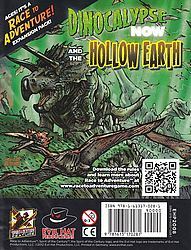 In the Hollow Earth mini-expansion, you'll Race into subterranean depths by sinkhole, underground river, and cave entrance. Will you be the one to uncover the lost treasure of the Neanderthals?